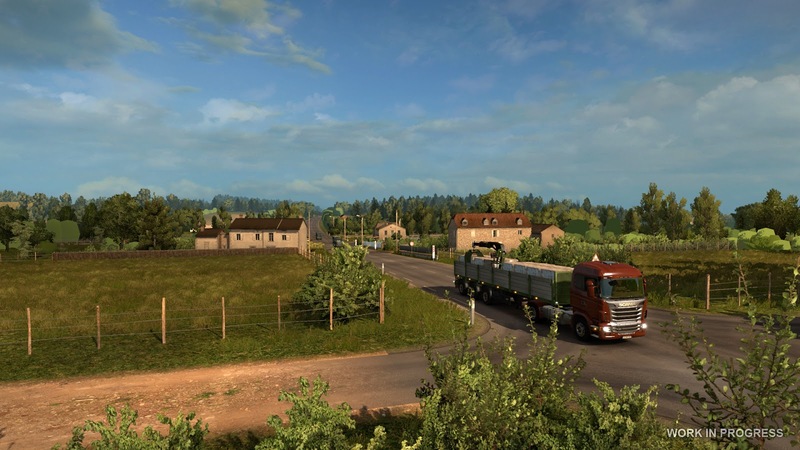 Aktuelle News zu dem neuen ETS2 - Page 87 - ETS2 - Talk & News & Screenshots - Trucksimulator24 - Die freundliche Trucksimulator Community rund um den Euro Truck Simulator 2, Euro Trucksimulator, German Truck Simulator, 18 Wheels of Steel Reihe, Extreme Trucker und den ZModeler. Kabinen Ausstattung kommt. Nur als DLC. Ansonsten gibt es unzählige Veränderungen, siehe Liste. Im Moment ist das noch PUBLIC. tweaks to physics, UI, sounds, and more. Added automatically generated Range-Splitter layout for H-Shifter. When shifter layout is named (attribute "name"), the name string is shown in the game for better recognition. Update 1.21 ist nun verfügbar. Prüft ob ihr schon patchen solltet. Der MP ist noch nicht zum Beispiel verändert. Der DLC kostet 3.59 und ist bei Steam nun erhältlich. Cabin Accessories DLC available now! 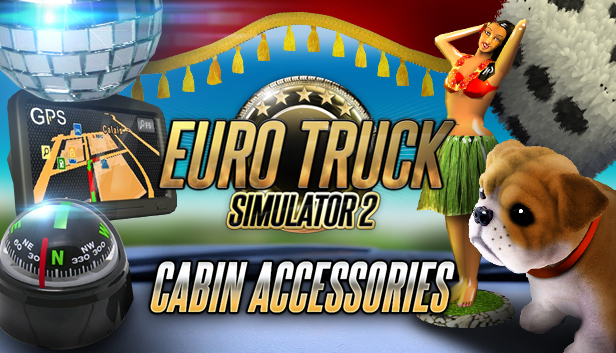 We are happy to announce that our brand new Cabin Accessories DLC is available now on Steam. creating such new content for you. but it also includes a ton of small fixes across the project. Spät aber dennoch der Vollständigkeit halber. 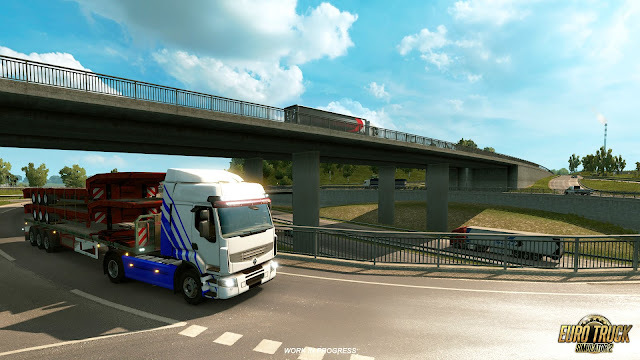 ETS2 Update 1.22 jetzt verfügbar! Spät, SCS goes Frankreich. Neuer DLC geplant. accessible in the base game, even if they are upgraded visually. for new trees and shrubs in some of the shots). DLC Frankreich nimmt Foremn an, und auch andere Starßenführungen sollen Einzu halten. prefabs for making highly detailed junctions. 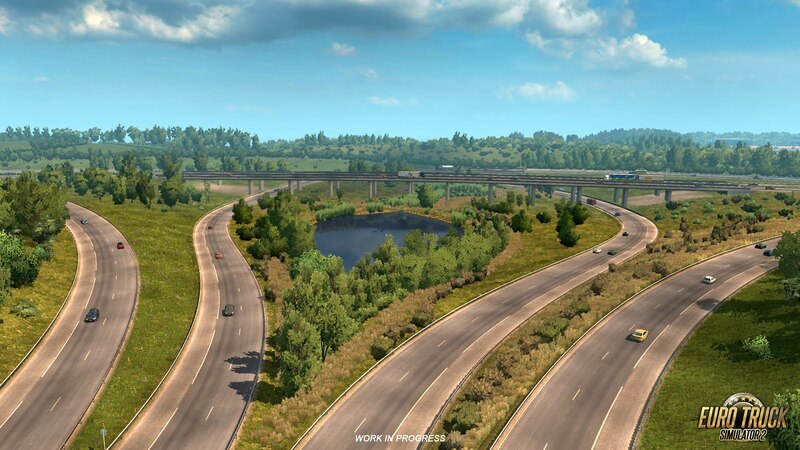 We are also paying close attention to how the road system blends with the surrounding terrain. Auf Steam ist jetzt das Update 1.33 Open Beta verfügbar ! A part of our hard-core fan community has been asking us for ages to involve them in the testing of our games, to allow them to see under the lid sooner. Last week, we decided to do a little trial and released an Experimental Beta of ETS Update 1.33. 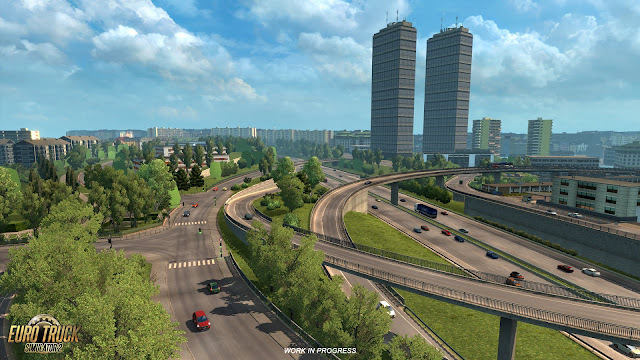 This was a build of the game which was not yet deemed stable enough for a large-scale public beta release, but having more feedback based on it would be a benefit for us to identify potential issues faster with more eyeballs on the new features. We only announced it on our forum and hoped for the best. The volume of feedback has proven that this was a successful experiment, spotting certain issues this early has definitely helped us a lot. With this experience, we may consider adding another step to our regular testing progress. We are always starting with internal betas, and continue first through a closed beta test with our much-appreciated stable cadre of trusted volunteer testers. 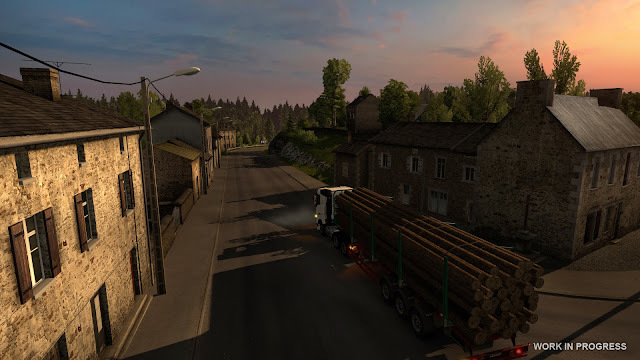 Now the new step may be a still-raw experimental beta for the most daring of you before we reach the widely publicized open beta release ahead of the final game update. 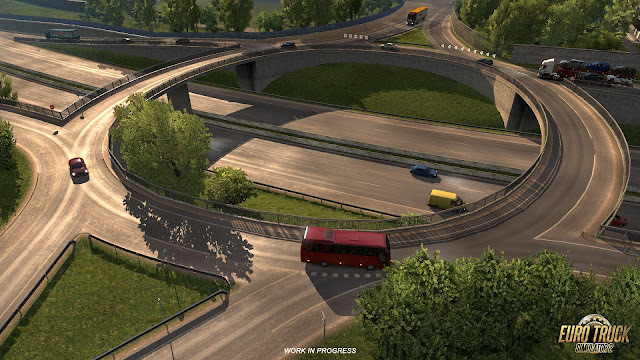 Thanks to everyone involved in the experimental beta, we are now able to launch the ETS2 Update 1.33 Open Beta sooner than anticipated! The system changes also bring certain features eagerly anticipated for quite some time. Generally the most important is the option of Steam cloud-based profile. No more profiles lost or deleted by mistake! No more need for keeping profiles stored on a flash drive for those playing on more than one PC! While this function needs some more testing, we hope to give you a safe place to store your profiles pretty soon. And the additions don’t stop there. Rain is said to have a calming Zen effect (a lot of our players are after the soothing experience of just driving through the cool countryside in our games), so to improve this effect, we improved the graphics effect of rain. Raindrops on the glass should behave more realistic now. Speaking of the driver's point of view, you should feel (and see) the improved physics right after you start your truck. The center of gravity for almost everything in the game was tweaked, along with suspension, damping and braking. 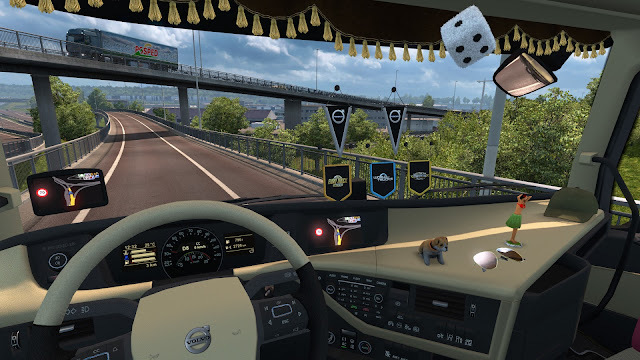 We are trying to find the right balance to make driving enjoyable for users of steering wheels and gaming controllers, as well as for players just using the keyboard. 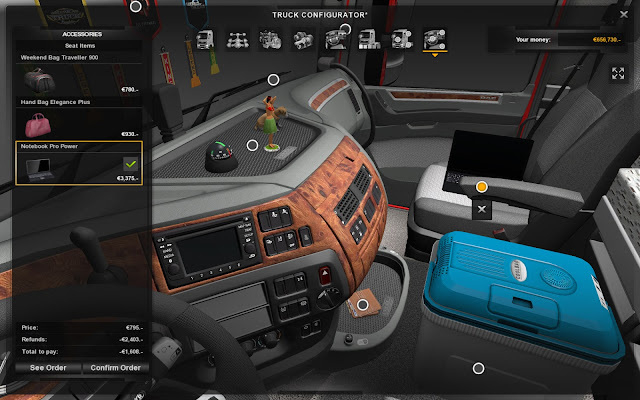 Driving your rig should feel different now, hopefully for the better. The newly added music shuffling may also help in this. To close the list of important changes, we've added a cvar for people having issues with blinking lights. Try different settings with writing g_disable_beacons 0/ 1/ 2 in the console. We hope that one of these will suit you well. If you wish to participate in the open beta, you can find this version in the public_beta branch on Steam. 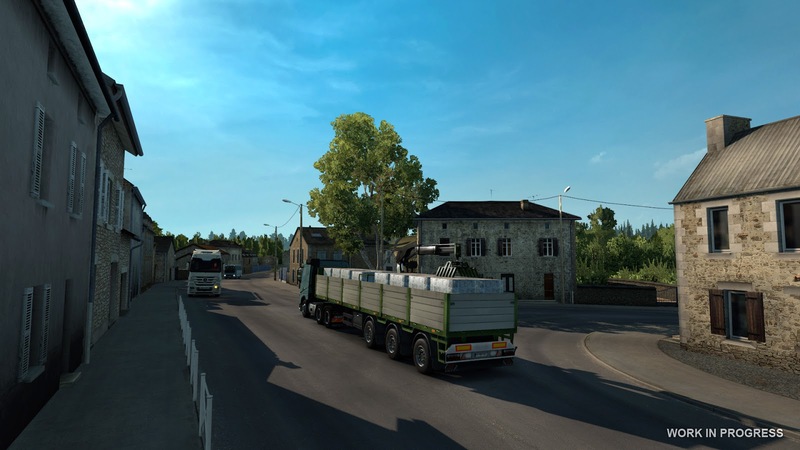 The way to access it is as follows: Steam client → LIBRARY → right click on Euro Truck Simulator 2 → Properties → Betas tab → public_beta → 1.33 public beta. No password required. Die Systemänderungen bringen auch bestimmte Funktionen mit großer Spannung in den Vordergrund. Im Allgemeinen ist die Option eines Steam Cloud-basierten Profils die wichtigste. Keine Profile mehr verloren oder aus Versehen gelöscht! Es ist nicht mehr nötig, Profile auf einem Flash-Laufwerk zu speichern, wenn Sie auf mehr als einem PC spielen! Diese Funktion erfordert zwar einige weitere Tests, wir hoffen jedoch, Ihnen bald einen sicheren Ort zum Speichern Ihrer Profile zu geben. Aufgrund der vielen Änderungen werden die meisten Mods ein wenig Arbeit brauchen, um aufzuholen! 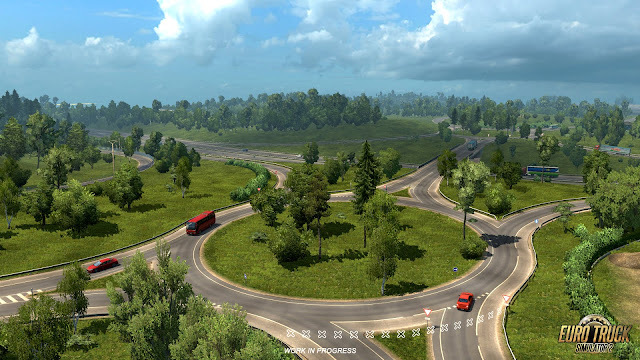 Ein paar neue Impression aus dem Beyond the Baltic Sea DLC. Das Update auf 1.33 ist jetzt verfügbar auf Steam. You're probably used by now to SCS bringing a new game update just ahead of a major DLC release. This time is no different. We need to add support for new features specific for the new DLC content, but we also take the opportunity to add new gameplay and technical features that every player of the game will enjoy. We've decided to do a little trial and released an Experimental Beta prior to the Public Beta. It proved us right with putting our trust into you, our amazing community – The Experimental Beta, or rather your bug reports and general feedback, helped us a great deal in getting to the stable Public Beta, and eventually to the full 1.33 update faster than anticipated. A huge thank you to all who participated in helping us to pinpoint all the problems the Beta builds had. This was one of the smoothest Betas we’ve ever had, which is interesting, considering the number of new features. So enjoy all the new additions - including our first update video! We hope you'll like it! To enjoy the 1.33 update, make sure to OPT OUT of beta branches and your game will be automatically updated on Steam. To shorten your wait, we plan to broadcast a live-stream from our just-established studio in SCS Software's office. It's our first experiment with streaming ourselves, so it may be a bit improvised, and the equipment and room setup is still not final, but it should be fine for today. We are looking forward to it a lot! We plan to do a couple of interviews with people from the development team, answer some of the questions that may come our way, and of course we will play the new DLC live most of the time. You can watch the stream either on our Steam developer page or on Twitch. The broadcast begins at 15:30 UTC, so don't miss it! As mentioned in the previous blog post, we will also publish three new national paint job packs bound with this expansion. It means that the players in Lithuania, Latvia, and Estonia will get an option to get and use their own unique graphics packs. 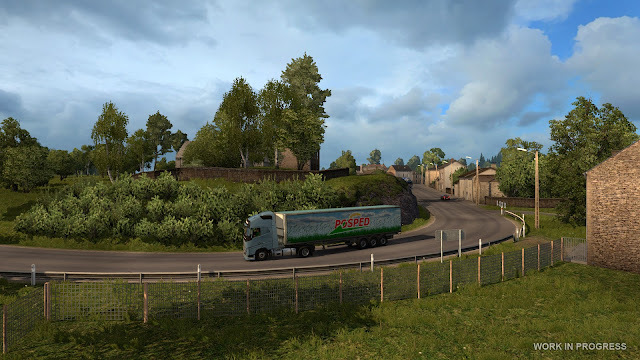 Typically, country-specific paintjobs are purchased by the players from the given country. But we know that there are some players out there who like to collect every DLC related to our game. So we have prepared a special sweetened offer lumping together the new map DLC with the paintjob packs of all the countries in it, including Finland and Russia which have been available for some time already. You may consider checking out this bundle first before clicking any other purchase button on the Steam Store. Um Ihre Wartezeit zu verkürzen, planen wir die Übertragung eines Live-Streams aus unserem gerade gegründeten Studio im Büro von SCS Software. Es ist unser erstes Experiment mit dem Streaming selbst, daher ist es vielleicht ein bisschen improvisiert, und die Ausstattung und der Raumaufbau sind noch nicht endgültig, aber für heute sollte es in Ordnung sein. Wir freuen uns sehr darauf! Wir haben vor, ein paar Interviews mit Leuten aus dem Entwicklungsteam zu führen, um einige der Fragen zu beantworten, die sich uns vielleicht stellen, und natürlich werden wir den neuen DLC die meiste Zeit live spielen. Sie können den Stream entweder auf unserer Steam-Entwicklerseite oder auf Twitch ansehen. Die Sendung beginnt um 15:30 UTC, also verpassen Sie sie nicht! Wie im vorherigen Blogpost erwähnt, werden wir auch drei neue nationale Job-Packs für Lacke veröffentlichen, die mit dieser Erweiterung verbunden sind. Dies bedeutet, dass die Spieler in Litauen, Lettland und Estland eine Option erhalten, um ihre eigenen einzigartigen Grafikpakete zu erhalten und zu verwenden. In der Regel werden landesspezifische Paintjobs von Spielern aus dem jeweiligen Land gekauft. Aber wir wissen, dass es einige Spieler gibt, die gerne jeden DLC sammeln, der sich auf unser Spiel bezieht. Deshalb haben wir ein spezielles Angebot zusammengestellt, das die neue Karte DLC mit den Paintpack-Paketen aller Länder, einschließlich Finnland und Russland, die bereits seit einiger Zeit erhältlich sind, zusammenfasst. Sie können dieses Bundle zuerst auschecken, bevor Sie auf eine andere Kaufschaltfläche im Steam Store klicken.